Can both warm and cool appear at the same time during Christmas celebration? Aim to celebrate a heart-warming yet cooling Christmas with customers, SDS announces special Christmas series, including coolest cake selections, warmest meals, and gift sets throughout this December. Christmas is known as the long anticipated holiday in a year. Celebrating Christmas has become a trend to all folks regardless of religious as it is the greatest time for gathering. “Christmas is the festive of joy, of holiday greetings exchanged, of gift-giving, and families and friends united. A unique Christmas cake, with a palatable Christmas meal have therefore become essential in this festive,” says Ms. Alice, Marketing Manager of SDS. 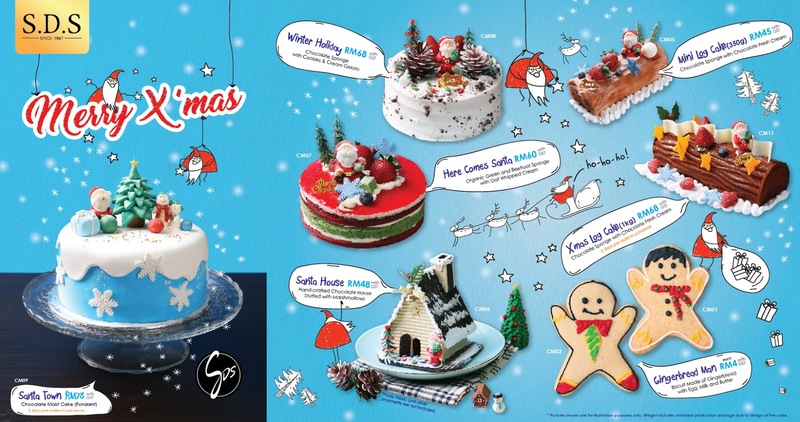 This year, SDS launches a series of well-loved traditional and novel Christmas cakes, ranges from RM 45 to 78 accordingly. Out of the six Christmas cakes launched, “Winter Holiday”, the low fat Gelato cake with chocolate sponge and “Cookies & Cream” Gelato, is the coolest indulgent for everyone living in this hot weather country. Camera-ready Christmas cakes such as “Here Comes Santa”, “Santa Town”, and “Santa House”, are designed to be eye-catching and worthy to share on social media. Classic yule log cake, “X’mas Log Cake” and its mini version, “Mini Log Cake”, are also available in SDS Christmas series. SDS Christmas cakes are available for pre-ordering at their outlets three days in advance, whereas “Santa Town”, fondant cake requires five days pre-ordering in advance. Collection period for cakes is until 1st January 2018. Despite ‘cool’ Christmas cakes, SDS has also introduced ‘warm’ Christmas meals too. 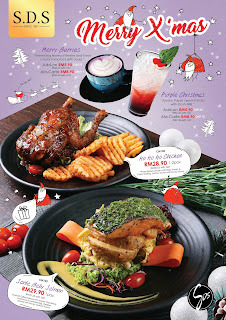 Dine-in customers are able to savour festive favourites including “Ho Ho Ho Chicken”, the whole spring chicken with stuffings served with lattice and special rocky sauce is specially designed for twin sharing. Fish lovers may savour “Santa Baby Salmon”, the salmon fillet grilled with honey mustard, served with mushroom scrambled egg, as well as crispy wedges. In addition to the warm meals, refreshing beverages including “Merry Berries”, berries and fresh cherry tomatoes with soda, and “Purple Christmas”, Kyushu purple sweet potato with fresh milk, are available for add-on now to complete a Christmas meal. “We understand the importance of showing care and love to our loved ones via gift giving. 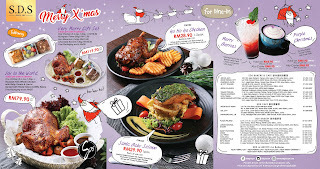 Therefore, we introduce Christmas chicken gift set for sharing with their loved ones.” Says Ms. Alice. SDS Christmas gift set including “Very Merry Gift Set”, one Roasted Herb Whole Chicken for 3 to 4 pax sharing, with mini bites of a can of Multigrain Flakes, Mini Macaron, and Chocolate Biscotti served on basket suitable for hand delivery. Roasted Herb Whole Chicken is marinated 24 hours and specially cooked to remain it’s juicy. “Joy to the World”, chicken only without mini bites are also available. Customers may pre-order gift set three days in advance at SDS outlets. “Christmas is the time of gratitude. Thus, we have specially crafted SDS Christmas Happy Holiday Greeting Card to be given away during this festive season. During our previous warm and happy event, “Jingle Jingle Potato Workshop”, we have DIY hand-made greeting card together with families participated in the event. We appreciate the warm atmosphere and interaction with families. 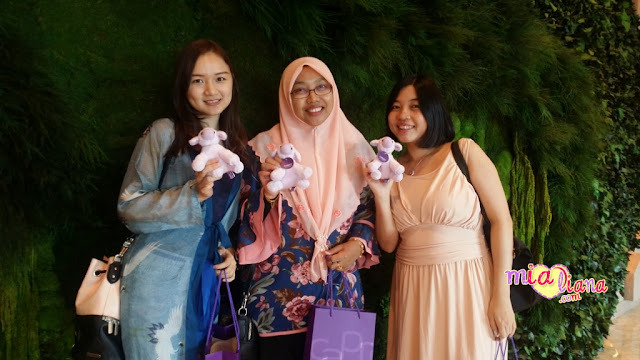 Finally, we gathered hand-made cards and turn them into ‘SDS Happy Holiday Greeting Cards’, hoping to spread out the harmonious ambience of SDS in this gracious festive season,” Commented Ms. Alice. 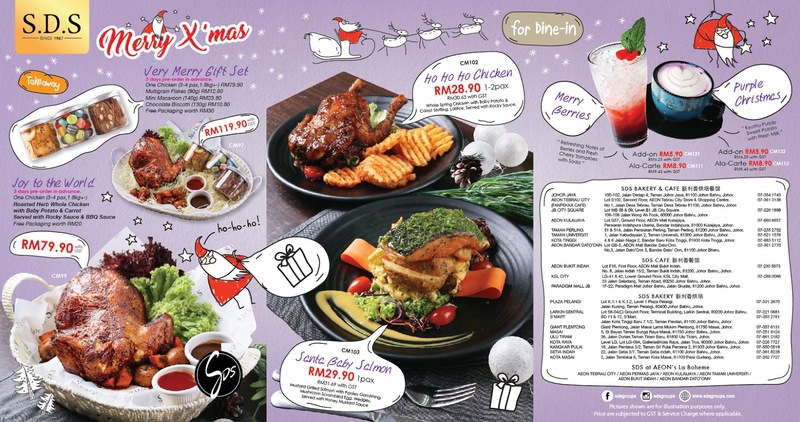 According to Ms. Alice, customers who celebrate Christmas moments at SDS with minimum purchase of RM30 are entitled to get the limited edition greeting cards. Besides, SDS fans can also collect greeting cards from SDS A-LI during his appearance in December at major shopping malls and outlets. Happy Holidays Greeting Card is available while stocks last. Kindly log on to SDS official Facebook at www.facebook.com/sdsgroups for SDS A-LI appearance schedule. SDS outlets in Johor are located at Paradigm Mall (NEWEST), AEON Bandar Dato’ Onn, AEON Tebrau City (Fanpekka Cafe), Johor Jaya, JB City Square, AEON Kulaijaya, Taman Perling, Taman Universiti, Kota Tinggi, KSL City Mall, AEON Bukit Indah, Larkin Sentral, Plaza Pelangi, S’Mart, Giant Plentong, Masai, Ulu Tiram, Kota Raya, Kangkar Pulai, Setia Indah, Kota Masai, and SDS Bakery at La Boheme AEON Tebrau City, AEON Kulaijaya, AEON Permas Jaya, AEON Bukit Indah, AEON Taman Universiti.